Further information on this digital resource can be found on our website www.amdigital.co.uk. 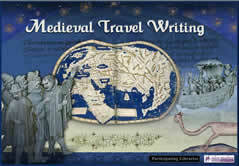 This project provides direct access to a widely scattered collection of original medieval manuscripts that describe travel - real and imaginary - in the Middle Ages. These sources tell us much about the attitudes and preconceptions of people across Europe in the medieval period, shedding light on issues of race, economics, trade, militarism, politics, literature and science. They will be welcomed by scholars in both literature and history as well as by French and German studies departments.